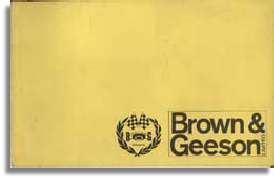 Another company very successful company at the accessory end of the market were B & G also known as Brown & Geeson. B&G weren't really specialists but managed to a great extent to be all things to all people. Offering a wide variety of accessories & tuning apparatus for a huge range of cars. Among the interesting things you will find in their catalogues are Benelite grilles and also Benelite wheel arch finishers, for that alloy wheel look without the expense. 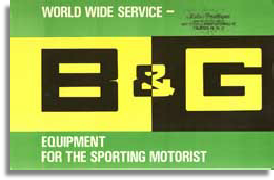 B & G have been successful for many years after the 60's offering their range of motor accessories & are one of the very few accessory companies from the 60's that are still thriving today. A very early B & G accessory catalogue with a relatively limited selection of products. This catalogue has a stronger motor sport theme than later catalogues. 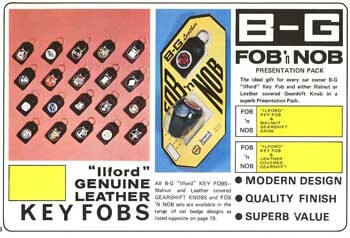 A later catalogue, the range of products has enlarged, but it has become more general with less of a motor sport theme.